If your building is visible from the beach, turn off your outside lights at 10 p.m. from 1 May - 31 October, the nesting and hatching season for Loggerheads. If any of your interior lights are visible from the beach or cast light on the beach, close blinds or drapes at 10 p.m. or turn them off. Never leave beach umbrellas, chairs, or any other beach accessories on the beach overnight. Nesting female turtles may get tangled in them, and for hatchlings they are often impassable and disorienting. If you are digging holes in the beach or building sand castles, please return the sand to its undisturbed state before leaving the beach. Both of these things can be death traps for hatchlings that stumble into them. Place all trash and recyclables in the appropriate receptacles. 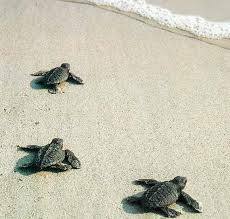 Never disturb a sea turtle nest, a nesting sea turtle or a hatchling. For additional information on loggerhead turtle protection click here.